For Omar de Frias, a long-time cigar aficionado himself, the dream of producing his own premium, hand rolled cigars began when as a young boy he walked through the doors of a local cigar shop in his hometown of Santo Domingo, DR and watched cigars being made. After following two wildly different career paths  one as a professional basketball player until he sustained a knee injury and the other with NASA  he hit pause, took stock, and decided it was time to pursue his true passion. Omar spent two years learning the business of cigars and launched the Fratello Cigar Company in 2013. 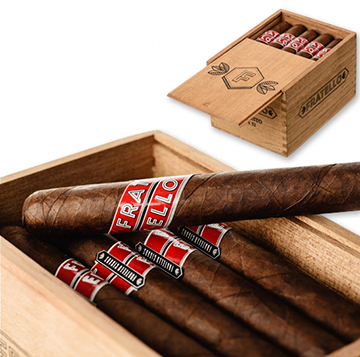 The company's first line of cigars is produced in Estelí, Nicaragua, and is also named Fratello, which was Omar's nickname in college and means "brother" in Italian. These full-flavored, medium-bodied cigars are remarkably complex and balanced with rich layers of subtle pepper, intense creaminess, spice, wood, and earthiness. Wrapped in a Nicaraguan Habano leaf over an Ecuadoran Sumatra binder with Nicaraguan and Peruvian fillers, Fratello cigars offer a unique and very enjoyable smoking experience. Take your taste buds on a joy ride!